This is a super easy card that I made for a swap that I participated in a while back. You can find Among the Branches stamp set on page 39 of the Stampin' Up! Holiday Catalog. If you ordered more than $50.00 of product from me this year and you didn't receive a catalog in the mail, send me an email and I will get one in the mail to you the same day! Card base: 4 1/4 in. x 11 in. Basic Black layer: 4 in. x 5 1/4 in. Enough Black Glimmer Paper to die cut a 2 3/4 in. circle and enough Crushed Curry to punch a 2 1/2 in. circle after it is stamped. Adhere both halves of Designer Series Paper onto black cardstock using the SNAIL adhesive. Using about 5 inches of washi tape, apply the tape to the DSP sea and back ends under and adhere to back of black cardstock. Stamp the Spooky image with black ink on Crushed Cury cardstock and punch out with 2 1/2 in. Circle Punch. Die cut black glimmer paper with the 2 3/4 in. circle die from the Circles framelits. 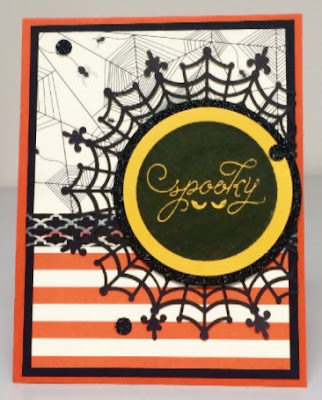 Adhere Spooky circle to black glimmer paper circle with the Multipurpose Liquid Glue and let dry. Position the spider web so it is off center and curve it behind the back of the black cardstock. Tape that down in the back with traditional tape. As you gently fold the web over the front, apply a few hidden pieces of SNAIL (where it won't show - under where the Spooky circle will go) and press down to hold web flat and in place. Adhere the black base piece with the web on it to the card base with SNAIL. Adhere Spooky piece to web piece with Dimensionals. Punch a few 1/4 in. circles from scrap black glimmer paper and adhere with Multipurpose Liquid Glue. Let dry. Think of someone special to send it to and mail it! Check out this week's Weekly Deals for more savings and the Clearance Rack for additional savings!